On the Corner of Second and Amsterdam in Detroit. Boyer, Burroughs and Ford. We made two trips over to the corner of Second and Amsterdam while we were visiting Detroit in August so that I could take a few pictures at the site of the Burroughs Adding Machine Company factory. 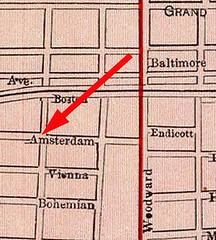 Here is the area as shown in an 1897 atlas so you can see it pre-freeway. Today, if you stand at the corner of Second and Amsterdam facing west, you see this view. If you were in the same spot in about 1913, it would have looked something like this. 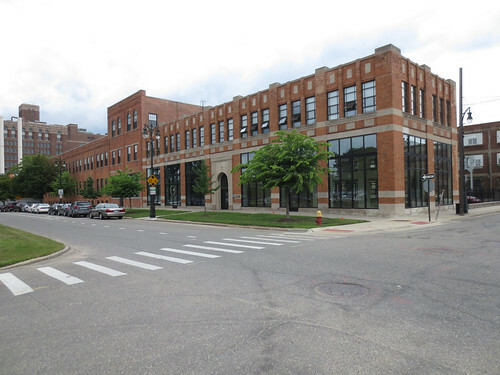 The building on the right dates from 1900 and was built by Joseph Boyer when he moved his Boyer Machine Company - lock, stock and barrel - from St. Louis to Detroit. 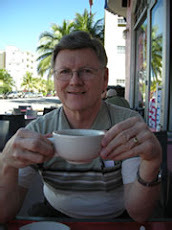 If you spend much time looking for information on Boyer and Detroit you can easily find a lot of mis-information. That's because Boyer moved two companies - lock, stock and barrel - from St. Louis to Detroit. The second move was of the American Arithmometer Company in 1904. 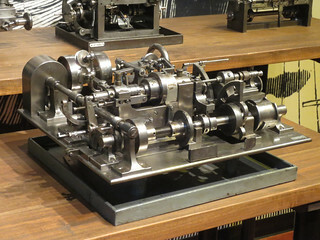 That company was renamed shortly after its arrival in Detroit as the Burroughs Adding Machine Company. Here are better views of those two buildings. 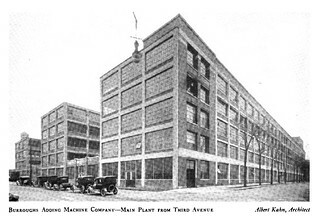 First, here is the Boyer Machine Company as pictured in an article from the March 8, 1901 issue of The Railway Age. That article, incidentally, credits factory superintendent A. J. Doughty with the idea for the "sawtooth roof" that provides natural light to the facility. That same information is also found in American Machinst of approximately the same date. They also credit the architecture to Louis Mullgardt of St. Louis. I mention that because Albert Kahn sometimes gets the credit for both. Kahn probably did work on the project as Mullgardt's representative in Detroit. He was "between firms" at the time and struggling. 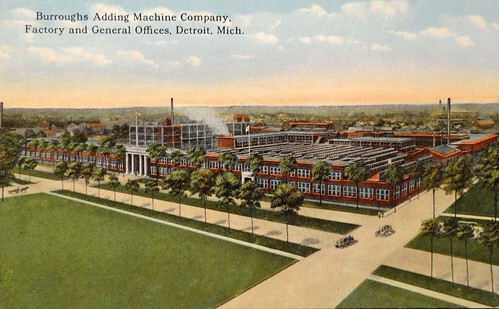 The Burroughs factory on the south side of the intersection was frequently shown in company advertising on postcards and blotters. By 1913 it looked like this. 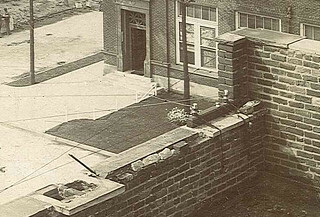 By the early 1920s it had expanded to fill two full blocks and the preferred vantage point for picturing the complex shifted a couple of blocks to the south on Second. 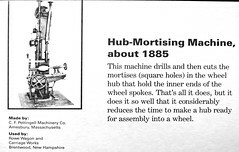 Let's go back to the beginnings of that Burroughs factory in 1904 and take a closer look. 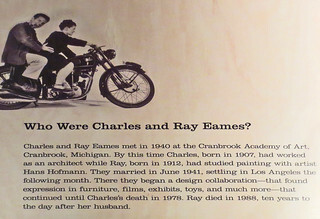 As always, if you are interested in anything related to computers and computer companies, the place to go to is the Charles Babbage Institute on the campus of the University of Minnesota. Among the many treasures at CBI are a series of construction photos taken from the northeast corner of Second and Amsterdam as the American Arithmometer factory took shape. This one was taken on August 16, 1904. This building was definitely Albert Kahn's work. Drawings, specifications, bid documents and project management were all by Kahn. 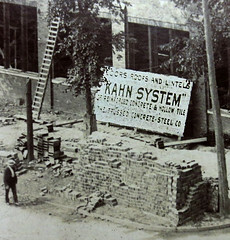 Take a close look at the photo and you can see evidence of Kahn's partnership with his brother on their reinforced concrete technology. Also, note the front door to Boyer Machine Company - although by then, it was a part of Chicago Pneumatic Tool Company (CPTCo). 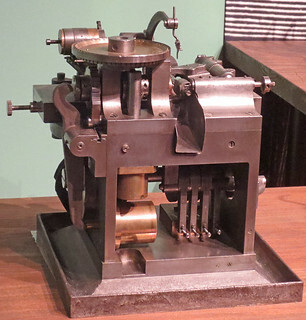 Boyer had sold his Machine company in order to buy a majority interest in the adding machine company. There is not much left from 1904 on the corner of Second and Amsterdam. 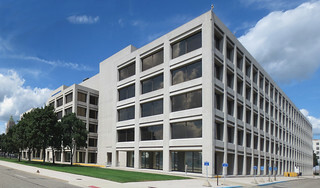 The CPTCo plant was actively producing the "Boyer Hammer" until the company consolidated much of their production in Utica, NY, in 1950 and the plant was closed. 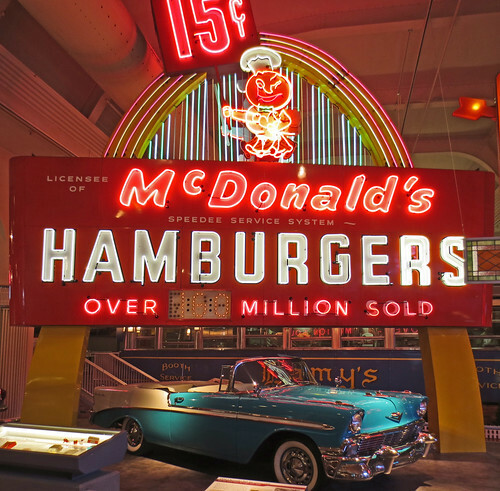 It was torn down and became a parking lot for General Motors headquarters employees. 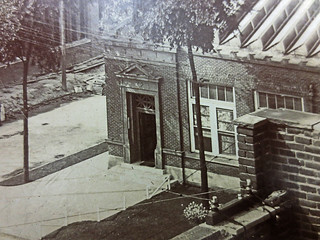 The Burroughs manufacturing plant was torn down in 1967 except for the three large buildings at the south end. Those were stripped to their skeletons and remodeled to form the Burroughs World Headquarters building. Later, they were sold to the Henry Ford Health System, their current owner. Perhaps you can see the resemblance on the Third Avenue side. But wait, didn't the title suggest something more about Henry Ford than that? Let's return to the year 1899. During August, Henry Ford and his backers formed the Detroit Automobile Co. and Ford became factory supervisor a block away over at 1343 Cass Avenue (Detroit addresses were renumberd in 1921. Amsterdam marked the beginning of the 1300s prior to that.) Henry, his wife Clara and son Edsel moved into a rental unit at 1292 Second. Living just across the street, Ford must have been very curious when Boyer's new factory began to take shape in the summer of 1900. In fact, we know that Ford was a frequent visitor to Boyer's shop. 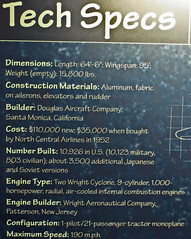 He met the man who would become his chief engineer, C. Harold Wills,(follow that link to Wikipedia and you will see some of the confusion that arises between Boyer's two businesses) at Boyer's shop. Ford obviously liked the neighborhood. When he constructed his first significant plant, it was less than five blocks away on Piquette Avenue. 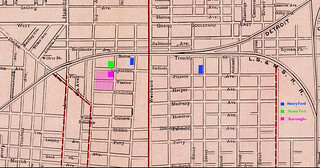 This map shows the locations of the Ford-related sites in blue, Boyer's plant in green and the ever-expanding Burroughs Adding Machine Company plant in red. 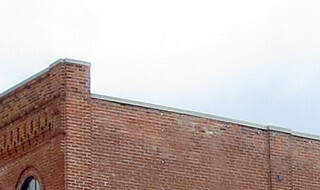 And while we are on the corner of Second and Amsterdam, lets take a look at the one building that does remain from 1904. Turn and look to the northeast. That condominium complex is made up of one old building and an adjacent newer addition. That was the Caille Brothers slot machine factory. 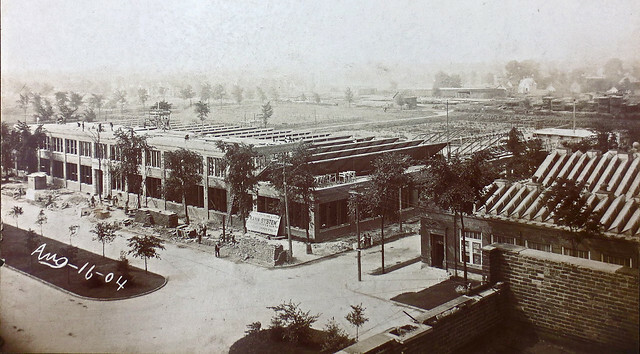 The construction photos of the 1904 American Arithmometer factory were taken from its roof. Notice the brick and stone at the top? Well, that's it for my contribution to the history of the New Amsterdam Historic District. I suppose I should get out my Wikipedia ID and update a little of that entry - like the "Burroughs Typewriter" caption on the photo, but I don't have the energy for it today. 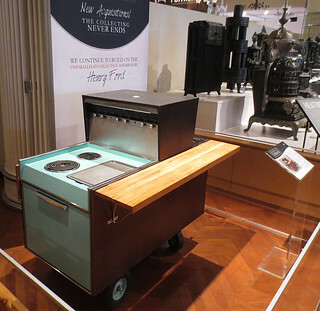 There is quite a collection of items in the Henry Ford unrelated to autos planes and other mechanical goodies. This Television exhibit was very interesting. The TVs are displaying scenes from the Kennedy assassination in 1963. 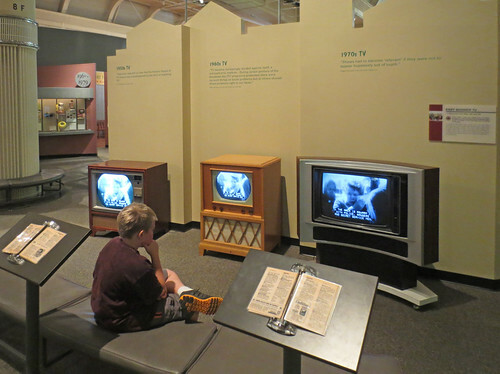 The young man watching appeared to be as drawn to the screen today as everyone was during that time in late November of '63. 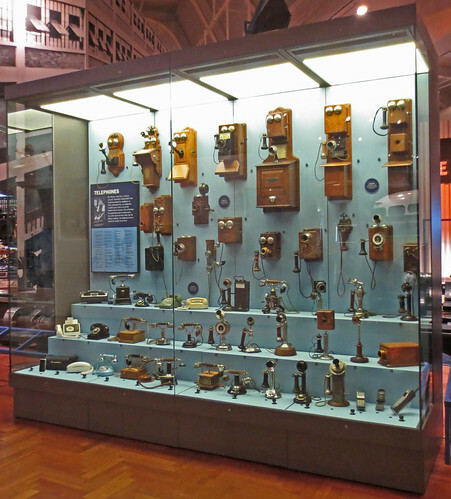 There is a wide range of telephones on display. 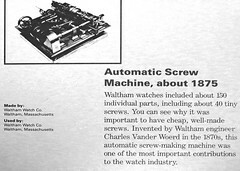 My dad had one of the model 302's (left picture) on his home desk until he passed away in 2001. 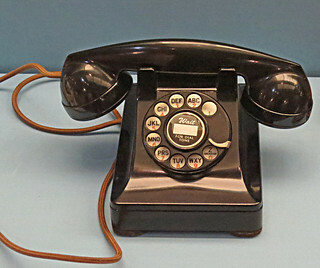 It was originally produced in the late 1930's. I'll bet you won't get 50 years use out of your current phone. 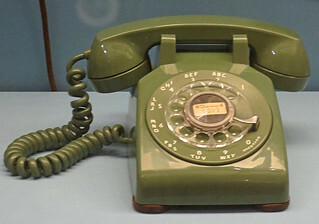 The model 500 (right picture) was the standard for the 1960s and 70s. 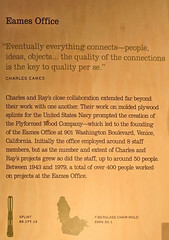 The museum doesn't just collect ordinary samples. Take this outdoor patio range. 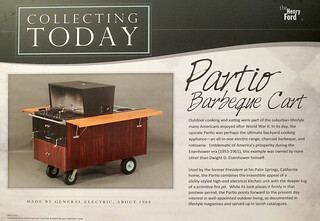 It belonged to retired president Eisenhower. There is a large furniture collection. 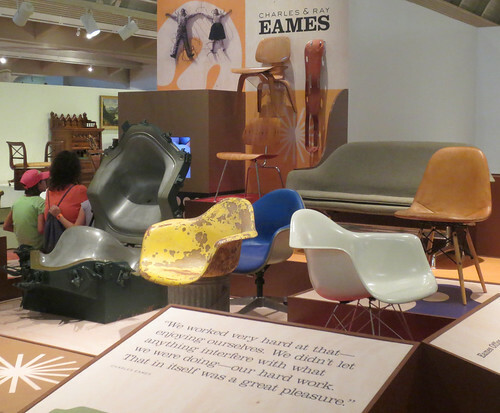 I took some pictures of just one variety - the Eames Chair. It might seem hard to believe that this was the essence of "modern" and fashionable at one time, but it was. Here we meet the designers. Not everything was modern, virtuous and perfect in America in the 1950s, of course. There is an interesting collection of items to remind us of our shortcomings too. 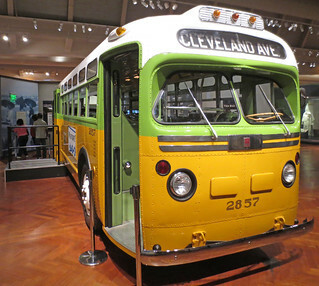 The bus that Rosa Parks rode in Montgomery is preserved here. (The one in Memphis is a replica.) 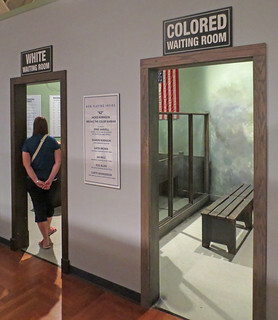 And a segregated waiting room holds numerous other memorabilia. 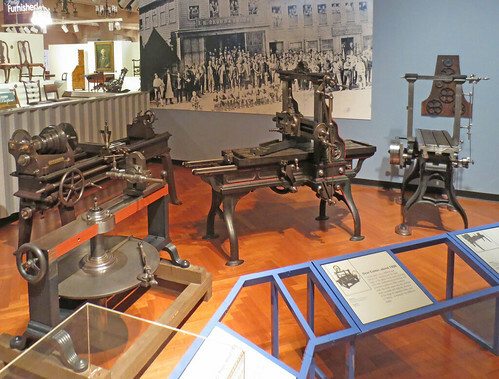 There is a section of the Henry Ford Museum devoted to tools. 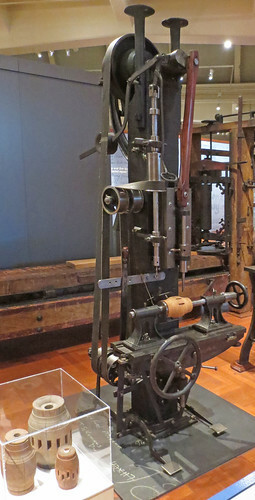 I found the exhibit of metal-working tools to be particularly interesting. 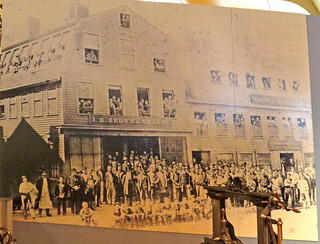 Most of the ones pictured below were produced between the end of the Civil War and the beginning of the Twentieth Century. This was a time of tremendous advance in agriculture, engineering and manufacturing owing to the development of these tools. 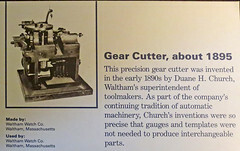 Most of the tools in the exhibit originated in the New England area from two companies. 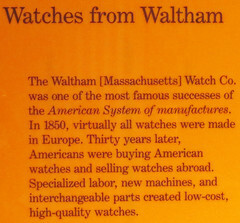 J. R. Brown & Sharpe of Providence, R.I., and Waltham Watch of Waltham, Mass. Here are a few pictures of the machines close up. 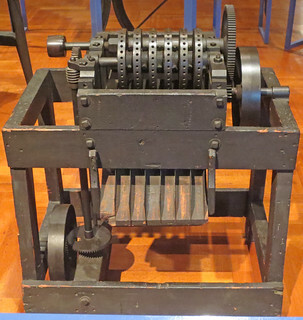 There is also a nice sample of gears, presumably cut on a gear-cutter similar to the one shown above. 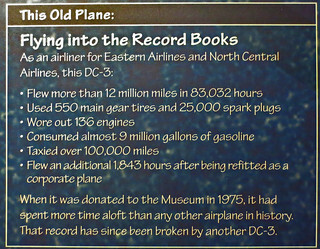 The aircraft collection in The Ford Museum is not large but it has a couple of great passenger planes that truly did change the world. 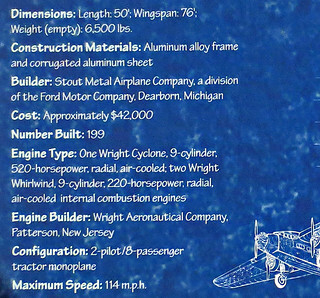 This Ford Trimotor is significant both for its individual achievements and for its importance as a new class of aircraft. 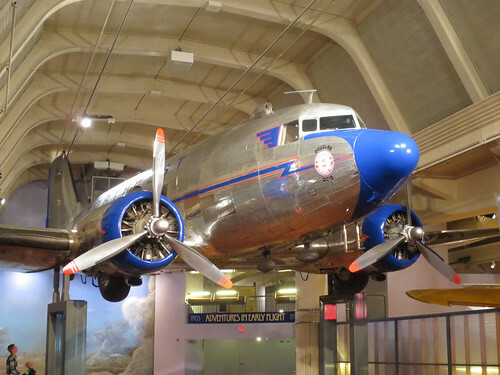 The Trimotor is famous for putting passenger aircraft in the air. With 199 manufactured, it was certainly the most popular of passenger planes as the airline industry began a slow takeoff. This particular craft was flown over the south pole carrying Admiral Byrd in 1929. 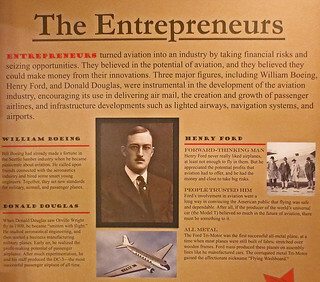 Ford was just one of the people getting into the aircraft business at the time. 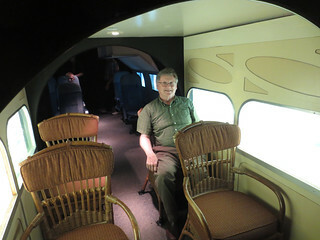 The exhibit gives you a chance to sit in one of the airline seats of the day. Notice that you don't have to worry about the passenger in the row ahead of you reclining into your lap. 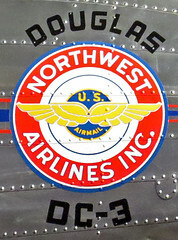 It was Donald Douglas that came up with the airplane that really started to build air traffic. This 1960's video shows West Coast Airlines' "newer" planes, but you might want to put on your necktie, light up a cigarette and reminisce about coffee poured from a chrome pot. Somehow, they found a clear day in the Cascades with no turbulence to film it. If that video doesn't bring back fond memories, then surely these "Fly Me!" print ads will.